Connectagons Wooden Snow Puzzle is a thirty piece brightly coloured addictive construction toy. Each wooden piece shaped like a snow flake has eight slots and connects into the other pieces allowing you to build all sorts of wonderful intricate shapes. 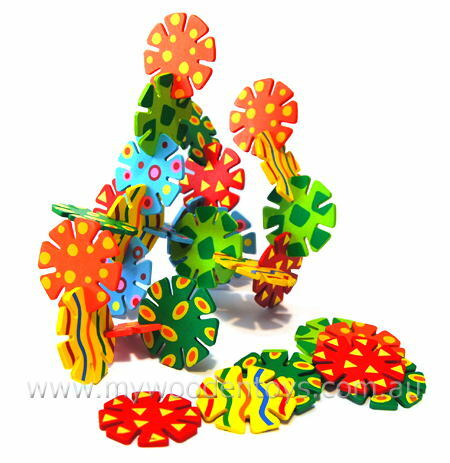 This wooden game is smooth and strong and decorated in beautiful colours and designs. Each thirty piece set will connect to any other thirty piece set allowing for truly huge constructions. We like this because: "Lovely to fiddle with and create crazy animals and shapes"